2012 sleeper hit (pun intended) Sleeping Dogs is set for a remastered release, in the form of a ‘Definitive Edition’ for the Xbox One and PS4. 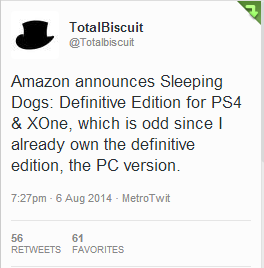 The only version shown on Amazon is a $59.99 limited edition that will be released for Xbox One and PS4 on October 14. The limited edition includes a special artbook packaging that consists of 28 pages of Sleeping Dogs concept art.